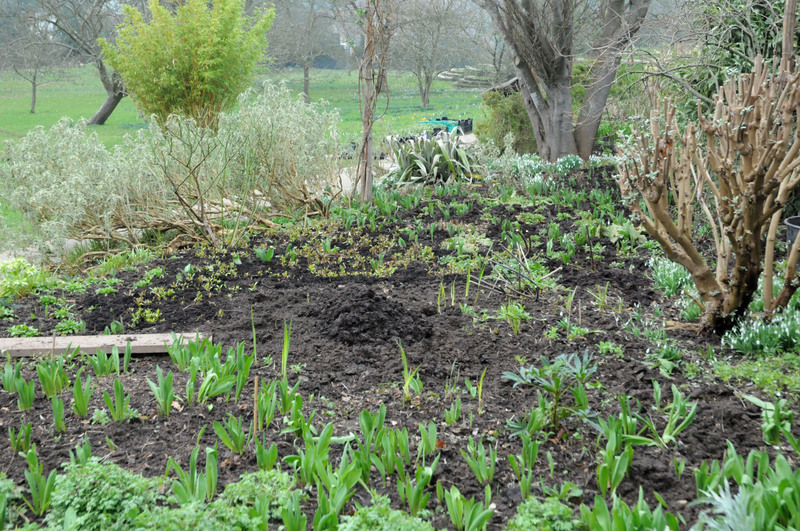 Beds are now starting to burst with new life (as above at Great Dixter) and now is the perfect time to start taking cuttings from perennial plants and save yourself a pretty penny too on new plants. 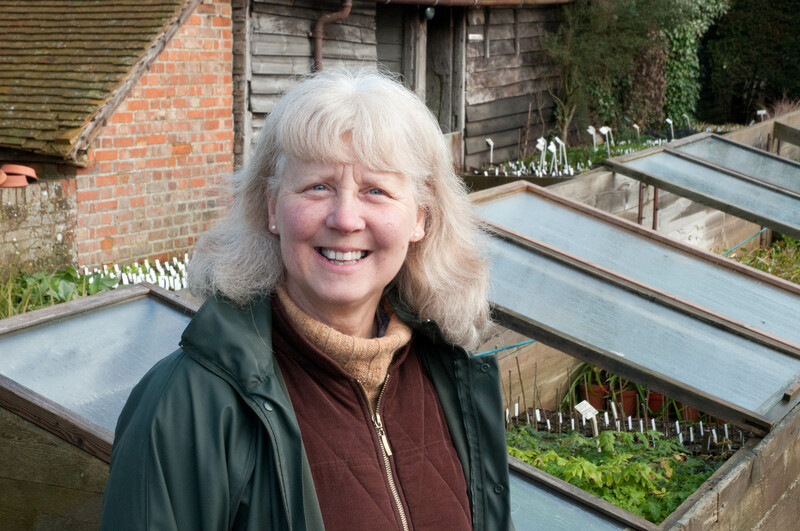 While I was at Great Dixterlast week, Kathleen walked me round the beds and nursery and pointed out which plants were ready to have cuttings taken. 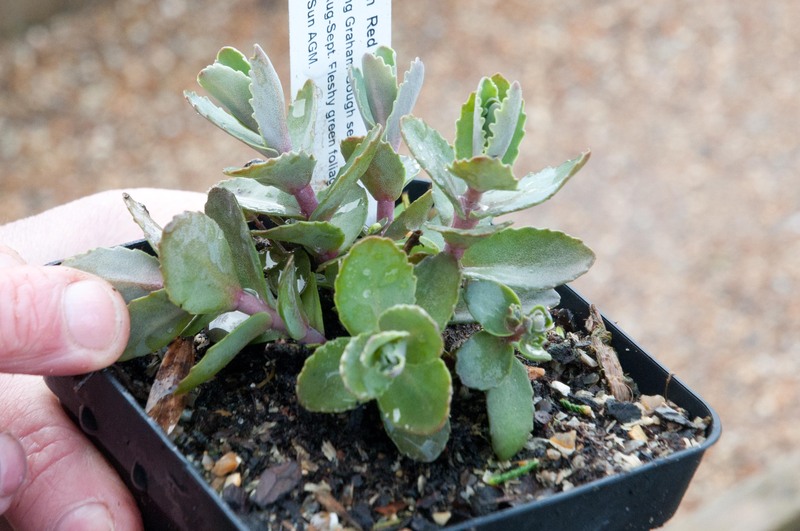 This Valerian centranthus rubra is just the right size (about 10cm) to take basal cuttings (cuttings from the base of the plant). 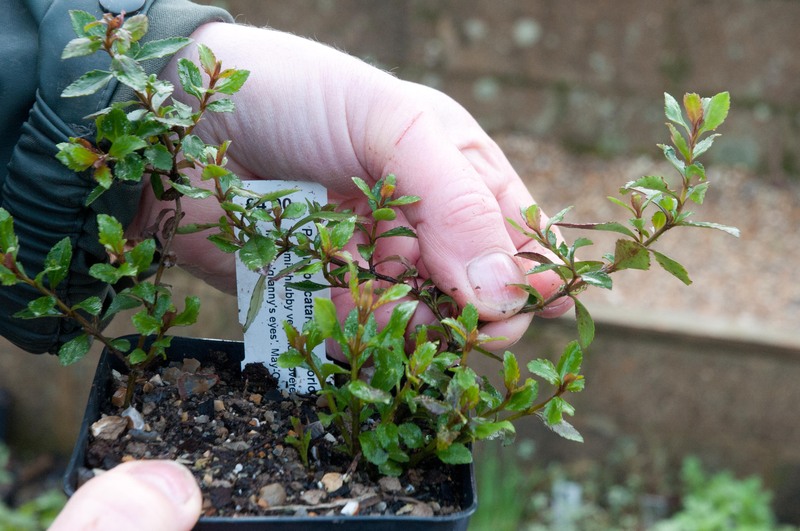 Take cuttings now when shoots are solid as later, when stems become hollow, shoots may rot instead of root. 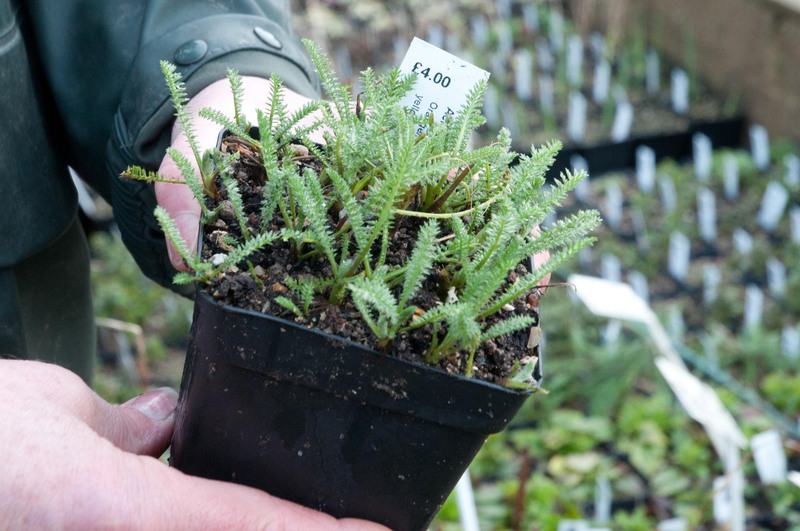 You can buy a pot of Achillea (above) for £4 and have another 20 plants for free. If you keep potting the cuttings on, then most should flower this year too. This Parahebe ‘Porlock’ has enough new growth for 4 to 5 cuttings. Again if potted on, cuttings should flower throughout summer, supplying masses of round mauve flowers from May to October. 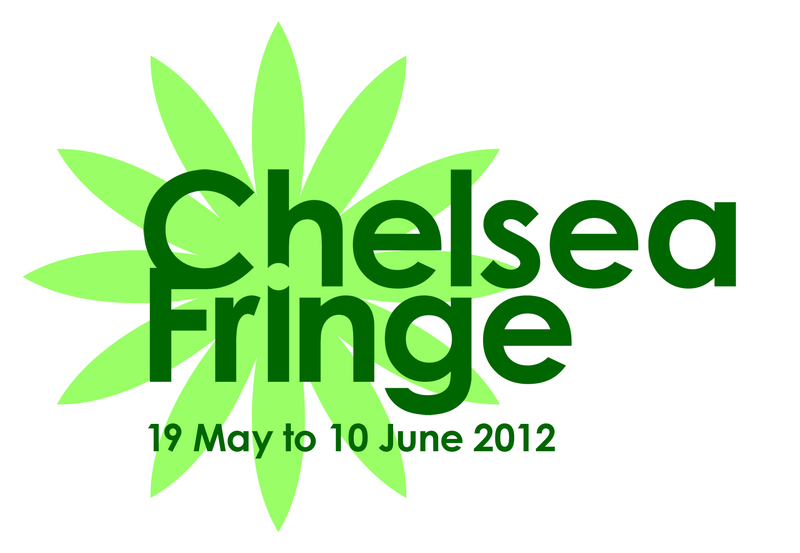 I love the sound of this plant for front of border, so I’ve bought one of these plants and will take cuttings today! Originally from Marchants Hardy Plants nursery, Sedum ‘Red Cauli’ will supply a number of new plants with ‘intense ruby-red flowers’. 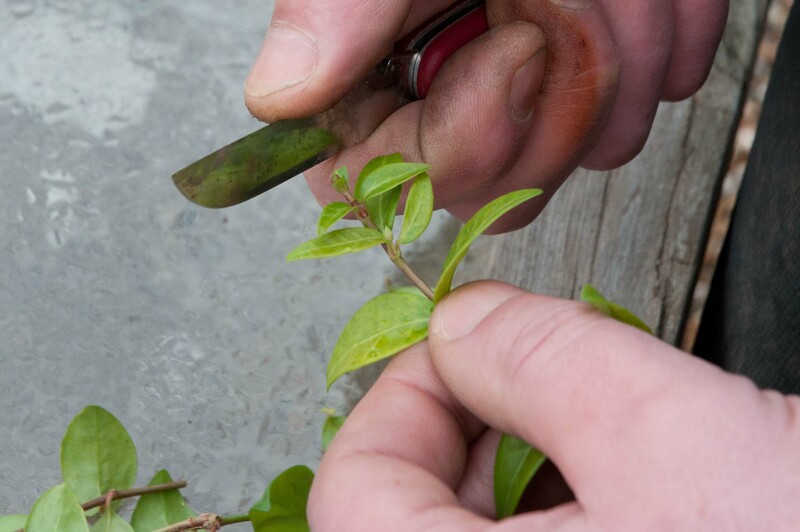 There’s no hard and fast rules about taking cuttings. You can take them any time of year, as long as you use good young plant material. 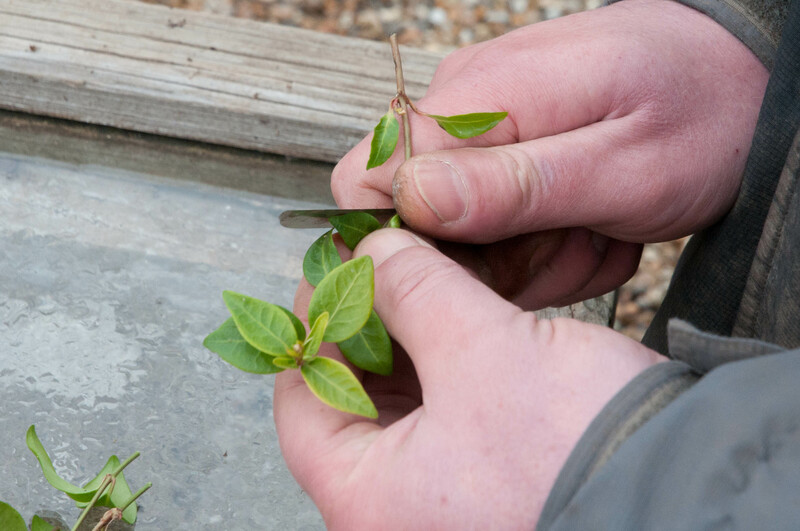 So here’s the ‘how to’ (take a stem cutting) using a nice young Vinca shoot and Michael’s expertise. Firstly, always with a sharp knife, cut just below a bud (where the leaves join the stem) as the bud is where the growth hormones are the strongest. Ideally, you want to be left with a shoot about 4-6 inches (10-15cm) long. If the plant has flowers developing, remove the flowering buds, as they will use up vital energy which is needed for root production. Remove most of the leaves, leaving 3-4 leaves at the top of the stem, as the rest of the stem will be in the soil, forming roots. Then place cutting in a soil -based gritty potting compost that has good drainage. Each pot can take a number of cuttings. Keep the soil moist, but do not over water. A fungicide can be used to prevent botrytis (a fungus that can develop in warm, damp, enclosed environments, where there is reduced air flow, killing your new plants). 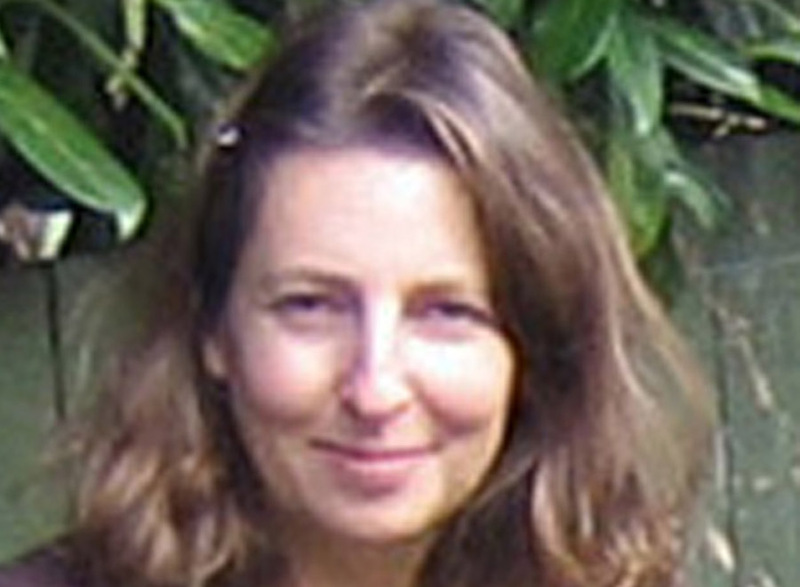 Alternate fungicides to prevent resistance to a particular brand. 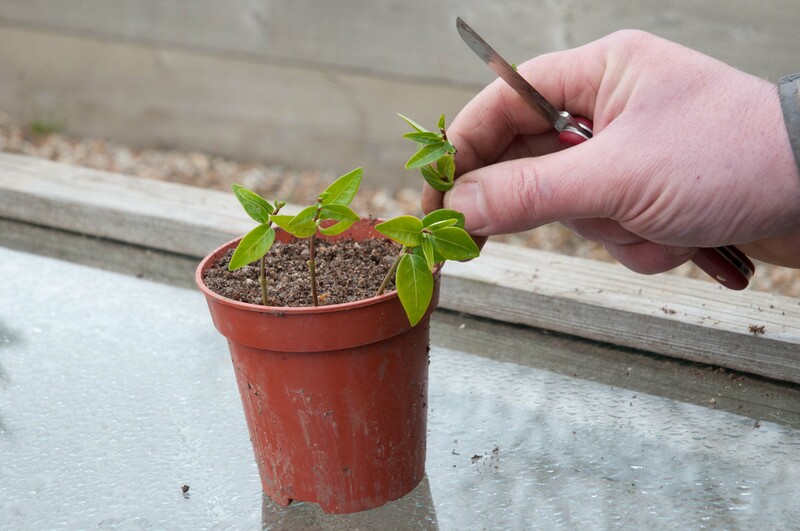 Cuttings can be put in a cold frame, greenhouse or in a propagator with bottom heat. Heat isn’t really necessary at this time of year, but it will hasten the rooting process. Alternatively, if you have neither a cold frame or propagator, cover the pot with a clear plastic bag, fasten onto pot using an elastic band and place pot in a cool but light position (a window sill is ideal). In a matter of a few weeks, shoots will start growing and you should start to see roots peeking out from the drainage holes in the pots. 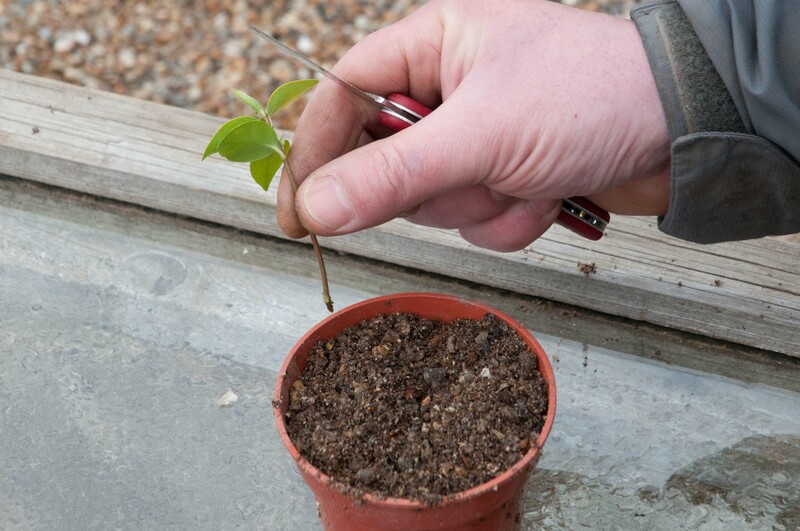 As soon as you see this, then it’s time to pot on cuttings to individual pots. 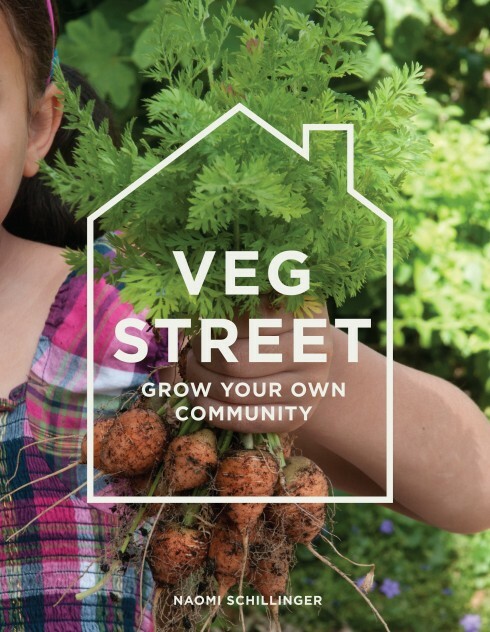 Grow them on, harden them off and then you will have great new plants to use in your garden.